If the exterior of your home is painted in a neutral color, like light browns, tan, beige, or gray, then a white garage door might be the perfect match for you. The white will brighten up the paint color of the house and can make everything come together very nicely if the trim is also in white. If you don�t want your garage door to stand out, then have a professional color match it to your home. This will make the house seem bigger and you can move the focal point of the front of your house away from the garage and towards the front door. If your home is white, then adding a color to your garage door will add some life and style to your home�s exterior look and showcase your personality, whether it�s a minimalistic neutral or a bright, energetic pop of color. For a sophisticated look, darker paints on a garage door really make a statement, like black or darker shades of blue and green. If your home is built with brick, then you can either paint your garage door white for a traditional and very clean style or use a color that is also found in brick, like brown, tan, or even wood, for a stylish and unified look. 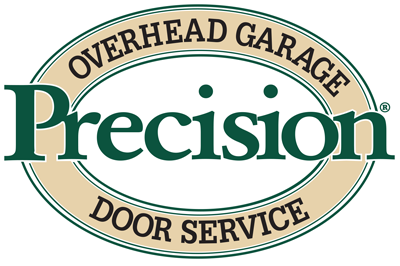 These are just a few tips and ideas to get you started but if you need more help, our experts at Precision Door would be glad to help! We can answer questions over the phone or schedule a visit to provide style and paint advice and even color match your home if you need to know exactly what shade was used to paint the house. We answer the phone 24/7 and provide same day service so you can get help today!